Where is the best place to buy desktop PCs? Here's what we found. 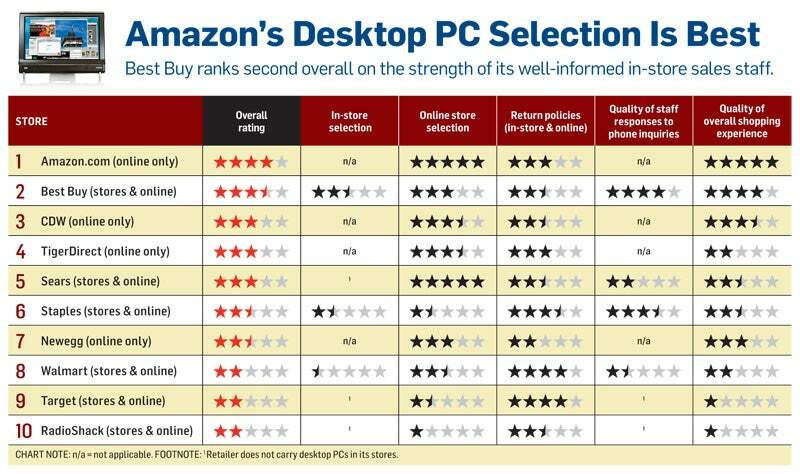 Amazon took first place among the retailers we investigated in the desktop PCs category. 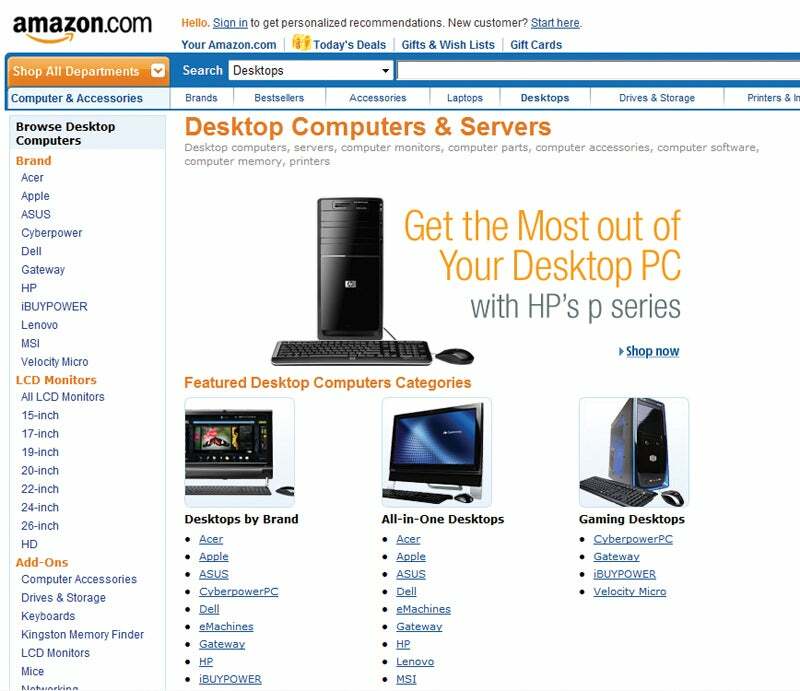 Amazon has the largest array of desktops available anywhere and one of the easiest-to-use Websites. Though prices were consistent across most of the retailers we looked at, Amazon's massive selection increases your odds of finding the best possible deal. Indeed, on some models we checked, prices were $75 to $100 below what you'd pay at the manufacturer's site. Amazon offers free (albeit not especially fast) shipping on all orders, and it doesn't charge sales tax in many states. Still, we recommend shopping around to discover a store's particular policies. (Click to enlarge the accompanying chart to see how all of the stores in our survey ranked for desktop PCs). Best Buy's online store earned the next-best overall rating after Amazon's. If you like to spend hands-on time with a PC before buying, its in-store experience is your best bet. Its staff ranked among the most helpful of the retailers we investigated. Reps answered our test questions accurately and often made alternative recommendations, based on our family-use scenarios. Online-only shops CDW, Newegg, and TigerDirect carried lots of PCs, but navigating the listings was harder than at Amazon, and the systems available were from smaller manufacturers. The online presentation at Sears.com was poorly thought out, and the customer service that we encountered at physical Sears stores was unpredictable at best. The retailer's phone system directs calls to the Sears Store Support Center, where an operator answers questions about basic product information and pricing. However, a salesperson in Minneapolis thoroughly answered our questions and recommended a capable (and less expensive) family-friendly PC similar to one on our shopping list. Staples generally gave solid advice over the phone. Its in-store array of PC models was smallish but adequate; its Website's selection was far more limited than many competitors'. RadioShack and Target carry few desktops online and none in their stores. When consulted by phone, Walmart's sales clerks had to shuffle to and from stockrooms to check on availability; this led to aggravatingly long hold times and (in some instances) less than cordial assistance. Walmart's Web presence was a bit better organized, but it offered the smallest selection we saw. We asked each store about the availability of four desktop PCs: the 27-inch Apple iMac with an Intel Core i5 processor, the Dell Inspiron Zino HD, the HP Touchsmart 300 All in One PC, and the HP Pavilion HPE-170t. Q: Which version of Windows 7 is right for me? A: Windows 7 Home Premium offers media sharing and user account protection suitable for PC buyers who don't need the business-oriented security and encryption features of the high-end Windows OSs. See "Technology's Most (and Least) Reliable Brands"--our annual reader survey of reliability and service for tech products, including desktop PCs. 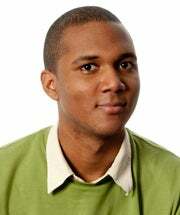 Staff Editor Nate Ralph is a member of the PCWorld Reviews staff, where he covers PC desktops. Amazon.com and Best Buy score highly in our research as great places to buy digital cameras. Making a desktop PC purchase? Our research shows that Amazon.com is the place to go to first. Amazon.com leads the pack in our research; Best Buy and Newegg tie for second.